StraightTalk - powered by Corning CU - Should You Get Your Kids a Debit Card? 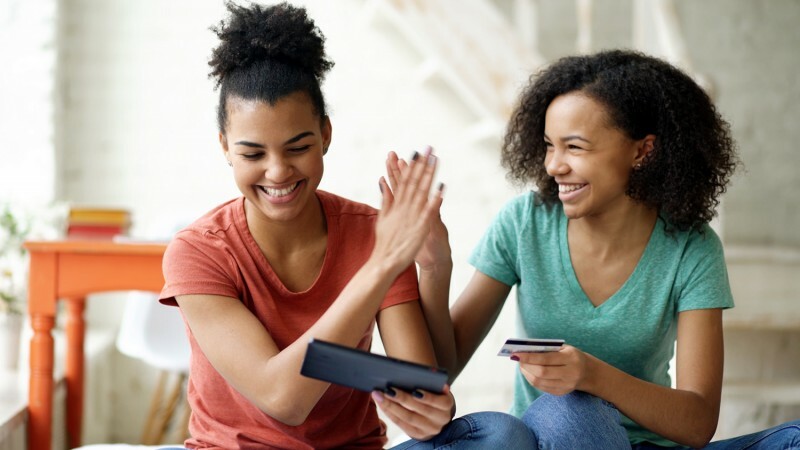 You can make a teen debit card an important step in building responsibility and lifelong spending habits. But the teaching is up to you! A debit card for your teen! Great idea. And that's what a lot of companies think you should get right now, too. And those companies are offering you cards with parental controls: Apps to track spending, set spending limits, block certain stores, or even block whole categories of purchases. Short answer: If you use that debit card as an important teaching tool about money management and the dangers of impulse buying, you're doing your teen a favor. You can use that card to help teach them the lifelong habits of caution and healthy skepticism when it comes to spending decisions. But if you hand that card over like a piece of candy without any instruction, you may be hurting your teen instead. You may be enabling them to become impulse buyers. But here's the problem, and the truth: Many companies encourage impulse buying! We believe businesses in general—and the debt industry specifically—love debit cards for teens, because they hook teens on plastic and quick spending. And like credit cards, debit cards have never met a purchase opportunity they didn't like. And spending with plastic can quickly seem like spending with play money, if your kids don't understand and think about what they are doing—especially if you're the one putting the money on that plastic. Let your teen know that a debit card is a budgeting tool, not a license to spend. Whatever money goes on that card, should come with some guidelines: "Part of this has to pay your school supplies and clothing. Part of this has to go into your savings. And a part of it you can play with. So, how do you plan to burn your money?" Have a conversation about these expectations with your teen, and give them the opportunity to ask questions. Teach teens that they must earn and deposit money before they spend it. "Earning" means having done something of value, whether it's having a birthday or mowing the lawn. And remember that savings jar? Get it out! Many teens barely realize that change is money. Make a point of asking your teen each week how much money their change jar can add to their checking account balance. Teach your teens that money isn't limitless. You can do this with simple conversations: "You want to buy those shoes? Okay, but then you won't have that money when you go off to school. You want to catch a movie? Okay, but, then you don't have money to buy that game you wanted." Teach your teens to postpone spending decisions. And be relentless with this lesson. "Why don't you think on that for a day or two?" can help cool a person's ardor for an impulse buy. And when the impulse passes, commend your kid: "Hey, you still have that money! Not a bad feeling, is it?" Don't quickly bail out your teens when they run out of money (which will happen.) Have you ever worried about over-spending? Do you already know that overspending can hurt? It's healthy for your teen to learn that lesson too. Hey, it's like choosing a diet! There are tons of options, and it's hard to know which one is best. But if you spend a little time doing research, you will find the card best suited to your teen's needs. Look closely at parental controls for teen debit cards. Are you seriously able and willing to pay attention to each transaction on your teen's debit card? If you are, great! If you're not, these controls would only serve a small purpose. Look at the card company's privacy settings. Does the company share your personal and financial information? Are you allowed to modify those settings? You want that option. Don't "impulse buy" a debit card – it is potentially valuable teaching tool. Do your homework before you ask them to do theirs! Here's a great way to remind you of the importance of teaching your kids the right debit card hab its: Work through the Impulse Buying Guide yourself. See how much money you may be throwing away in impulse buying in your life. Let us know if this article helps, and good luck!